Baxter Springs, the largest community in Cherokee County, once was a rest stop for the Osage Indians as they traveled toward their summer hunting grounds. Chief Black Dog and members of this tribe paused at the mineral springs that once flowed just south of what is now East Seventh Street. They believed the water had miraculous healing properties and they routed their trek purposely to partake of the flowing springs. About 1849, John Baxter arrived to establish a trading post/travern beside the Indian trail and near the springs. The city's name derived from the frontier man's establishment, which was known as Baxter's Place and from the springs. Fort Blair, a small Federal Army post, was established north of the springs, along the Military Road between Fort Scott and Fort Gibson. It was here that Confederate guerillas under the command of William Clark Quantrill, struck about noon on October 6, 1863, then moved to massacre a contingent of troops being led toward Fort Smith by General James G. Blunt. The dead, for the most part, are buried in Baxter Springs Cemetery, just west of the city. Following the Civil War, Baxter Springs became known far and wide as one of the wildest cowtowns of the West. Drovers, bringing herds of cattle northward from Texas to Missouri, found the town a welcome respite after three or four months on the dusty trail. Leaving the longhorn cattle to feed on the lush grasses of the prairie in Indian Territory, the drovers made the most of the numerous saloons and other attractions of what is now known as the "First Cowtown in Kansas." 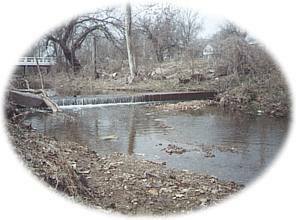 The city was christened Baxter Springs when it was incorporated in 1868. When the railroad moved to Texas, so did the cattle drives, leaving the city deeply depressed. During the period of hard times, it was discovered that the mineral springs had wonderful health-giving properties and Baxter Springs became a famous health spa. Spring Park was a popular gathering spot. The Old Soldiers and Sailors Reunions which followed the Civil War and continued until 1914, also brought fame to the city and hordes of veterans, their families and the businesses needed to sustain them through the weeks of oratory and other pleasures. Unwelcome visitors through the years have included a number of ruffians intent on robbing the local banks - - - Jesse James, Cole Younger, the Daltons gang and later Henry Starr and his gang. With the discovery of lead and zinc in the Tri-State district, Baxter Springs became a prosperous business center. The demise of mining left its mark, but unlike many other less fortunate communities, the city recovered through the diversification of business, agriculture and industry to become one of the most attractive and progressive cities in the area. Located on the grounds of the Historical Museum, the marker commemorates the Black Dog Trail opened in 1803 by Chief Black Dog ( Manka - Chonka) and his band of Osage Indians who had a village nearby where springs once flowed freely.